Devoted to a Rational Investigation of Modern Spiritualism / A Paper for Spiritualists and Investigators. Los Angeles, CA. Editor: E.D. Lunt, succeeded in 1899 by E.M. Carlson. Succeeded by: Philosophical Journal? 1/1, February 1895-1900(?) Fifty cents / $1.00 a year. 16-20 pp. Started as a single 8 x 6 sheet, printed front and back, and then published as an 8 and then 16 pp. journal, 7 x 10. The advertisement in the Flaming Sword, December 1897, says the journal was in its fourth year. The Banner of Light announced in March 1899 that The Medium’s subscription list had been taken over by The Philosophical Journal, the rump of The Religio-Philosophical Journal, but the journal is still noted in "List of Advance Thought Publications," The New Cycle, March 1900, 159-60. The advertisement in the Free Man for September 1899 says that the journal was "devoted to a Rational Investigation of the claims of Modern Spiritualism. It contains each week articles from the most advanced thinkers and best mediums in the country, and gives especial attention to the development of the various phases of mediumship." Lunt also edited The Modern Mystic and The Mystic and Medium, which may be continuations of this journal. He was also, as Marc Demarest has discovered, the author of Mysteries of the Seance, published under the name of "A Life-Long Spiritualist" in Boston in 1903, and the inventor of a wireless telephone to communicate with the spirits. Regular contributions by Carlyle Petersilea (inspired by Charles Dickens). Rowell's American Newspaper Directory for 1900 says the journal had a circulation of less than 1,000. 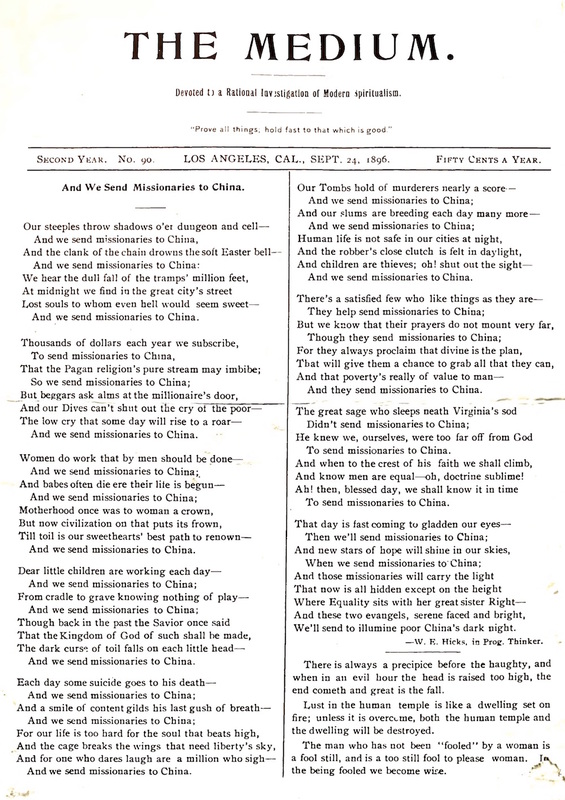 NSAC Lily Dale has the issue for September 4, 1896 only, and California Historical Society that for February 1895.